In the adult world, our brains rule the roost. Your brain will happily tell you so. And it does have a very essential role to play; our brains analyse, plan, reflect and respond. We often think of our brain as the control centre. Without our brain we wouldn’t be much of the species that we are. The brain is an incredibly complex organ, most of the time when we think of our brain we think of it as thoughts and memories. So (albeit a little crudely); I will be referring to this aspect of the brain, the neo-cortex, as the “thinking brain”. The thinking brain is actually the end result of a whole chain of complex processes kind of like a relay team race. In a relay race the team members each have a different role such as swimming, riding or running. Each team-member completes their role and passes the baton on until it comes to the last member. The last team member is usually the one who everyone see’s because they are the one to make it over the finish line in front of the crowd. This is kind of like our thinking brain; it’s the last part of a larger chain of body processes but we notice it most because it is the last relay member. It makes it over the finish line and in this instance it is a glory lover. Many psychology types work with the last relay member in the race, the “thinking brain”. Probably one of the most well-known and empirically researched is Cognitive Behavioural Therapy or CBT. CBT can be an effective way of learning how behaviours and cognitions (i.e. thoughts) are linked. Quite often unhealthy or repetitive behaviours are influenced by thinking patterns. Essentially by changing or becoming aware of these thought patterns we can break a cycle and attempt to reform to healthier habits and behaviours. Sounds fabulous, but it can get a bit complicated if the race is already loosing well before the baton gets to its last team member. It is also worth mentioning that while CBT can be effective with children as well as adults it can have greater limitations. One possible explanation is that this is because children are still developing parts of their “thinking brain” – the Neocortex. A particular part of the Neocortex called the Medial Prefrontal Cortex is the last part of the brain to develop and part of its role is to help us to make sense of our experiences. The Medial Prefrontal Cortex is important for various abilities such as foresight, reflecting, decision making, motivation and persistence (Van Der Kolk, 2014). Van Der Kolk (2014) likens this part of the brain to a watchtower. For a child their watchtower is short, they are immersed in the “field” of their experiences and are ultimately unable to gain distance from them. This is why it can be hard to reason children out of emotions. As we grow our watchtower grows and we become better able to step out of and reflect on our experiences and thoughts. It is believed that this part of brain continues to grow through adolescence (hello risk-taking, irrational teenagers!). So back to the relay race, let’s look at the other possible team members (remember neuroscience is extremely complicated; I am being rather crude with my explanations for the purpose of this blog). In the relay race we have 4 team members; body, heart, unconscious brain and finally thinking brain (who we’ve already spoken about). Therapeutic interventions engaging any of these “team members” can support healing. This is because helping a team member to run their segment of the race is going to have an effect on the race as a whole. I guess by now you have realised that the metaphorical race I keep referring to isn’t really a race to something but instead the act of living healthily and optimally. This concept of interconnected mind and body is one of the fundamental reasons why I am an advocate for holistic and eclectic approaches to psychological wellbeing or healing. It is important to treat the heart, body and brain together. Just as in a race, assisting the team member who is struggling the most is a good place to start. Once each team member is effectively completing their segment of the relay, the race runs more smoothly. So I discussed earlier that one of the therapeutic interventions for a struggling “thinking brain” is CBT. Coupled with mindfulness it can be a great place to start, particularly for adults. Our thinking brain loves glory, is known to have a bit of an ego (from all that time in the spotlight) and can easily get carried away, reflecting on some of its habits can be really useful. Physiotherapy, occupational therapy, medical intervention, massage, yoga and breathing exercises are modalities (amongst many) that can target the physical body, helping to release tension, improve movement and quality of life from both physical and psychological related ailments. So that leaves us with heart and the unconscious brain. I’ve used the heart a bit cheekily here as it is a symbol for feeling rather than an oxygenating blood pump. Eternally regarded as the home to love and heartache it seems fitting. Our unconscious brain is again a lot more complex than what I am describing here. Basically I am alluding to the part of our brain that stores feeling and memory in a sensory capacity, it holds the material that influences our thoughts, actions and behaviour (even when we don’t realise it!). The BBC did a fun and fascinating series of how our Unconscious Brain shapes our life and our abilities which you can read about here. Commonly creative and expressive therapies (like art, music and dance therapy) target the heart and the “unconscious brain”. In adults they can be the most ignored members of the race when the going gets tough. Positioned at the midpoint of the race their bearing on the outcome can be huge. A race started well can easily be lost or be an uphill battle in the last leg based on how the middle members perform. Some of society’s apprehension towards treating these two members of the race is because they are enigmatic in nature; they hard to measure and are felt rather than thought. Remember at the start of this post I said the thinking brain loves to tell you it rules the roost? Well this is where it is particularly relevant. The louder our thinking voice and the more power we give it, the less we accommodate to other ways of knowing, experiencing and healing. As adults some of us become able to explore our feelings and unconscious motivators using verbal and cognitive means. Well trained psychotherapists are good at assisting us with this. Mostly though we use creative or physical modalities to support our healing; think about the ways you heal a broken heart or change a destructive habit or behaviour; it is usually by doing something. Sure we talk about it and think about it too, but talking or thinking is only going to get us so far. 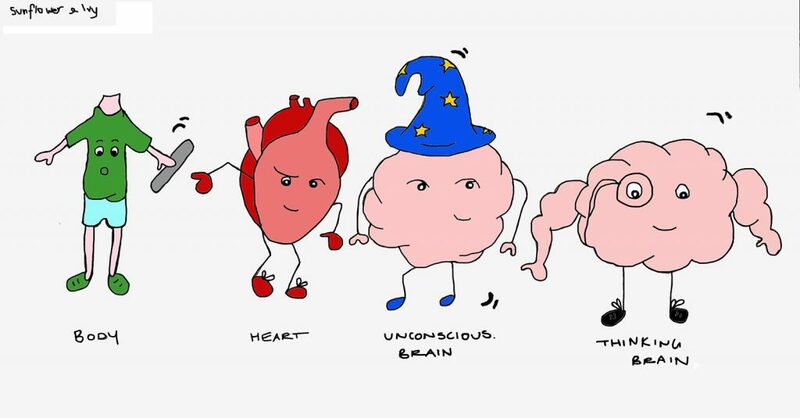 The unconscious brain and the heart share a passion for the symbolic. Symbols are representations of qualities, ideas, feeling and experience. By using symbols something that is indescribable or expressible becomes tangible. Children are experts at using their imagination to express symbolism to help them process and explore feelings and unconscious worries or concerns. Watch a chid play and you will observe that they construct an alternative reality. They are excellent storytellers. Listen closely and you will notice elements of truth interwoven with fiction. They might start with a character named after them, which for all best intentions is them until they grow 2 pairs of wings, the ability to be immortal and they have all the friends of the land. Children do fantasy and they do fantasy really well. And fantasy is healing. Why? Well, it offers reprieve from current reality (escapism), creates a sense of empowerment because the narrative is adaptable, allows for experimentation and problem solving, is cathartic by releasing pent up emotion and it allows the process of differentiation i.e. distance. You know how I said children can be limited in CBT because they have a short watchtower. Well play and creativity is a process that allows the child to remove their watchtower from their environment and place it, hypothetically in another land (fantasy). In doing this they gain a certain level of separation which can support them to grow awareness of their situation in a knowing kind of way rather than a thinking kind of way. Creative expression whether that is play, art or music also acts as confirmation of our experience, feelings and dreams- It is akin to being heard. Sometimes the excitement that one type of therapy is successful for a lot of people can make it easy to be single-minded; after all we would all love a quick and simple cure. It would be wonderful if CBT could help all suffering adults and art therapy could heal all children. It is just not the case. There are so many factors at play from personality and beliefs to quality of practitioners. In summary it is important that we not only avoid prescribing to others what has worked for ourselves but we continue (and for many of us begin) to look at psychological healing through the relay race. By reviewing the relationship and role of our biological organs and how each of the relay team members perform in the race the complexity and multi-layered process of healing becomes clearer, giving us an improved chance of healing.